IN THE UNITED STATES, no body of documentary photography has been as iconic as that produced from roughly 1936 to 1940 under the auspices of the Farm Security Administration. The FSA's photographic wing, its Historical Section, undertook to create a record of the devastation that the Great Depression had wrought on ordinary Americans; in offering up an archive of the national trauma, it aimed to convince a national public of the fitness of the New Deal to redress it. In this sense, profound loss was more than just the subject of the Historical Section's unprecedented project: it was its informing ethos. When the archive's mastermind, Roy Emerson Stryker, sent the gifted photographers on his payroll into the field to create "a pictorial encyclopedia" of Depression-era America, his last instructions were: "Keep your eyes open for a rag doll and a corn tester." But by the mid-1930s, this mental map of the United States as a confederation of small merchants and agrarian landholders under threat-"the farms and the little towns and the highways between"-was already anachronistic. Between 1880 and 1924, the so-called golden age of immigration had created some twenty million new U.S. citizens, preponderantly urban, and the Great Migration of the 1910s and '20s had brought millions of African Americans from the sharecropping South to the industrial Midwest and North. In light of these epochal changes, the project of documenting the ur-realities of rural labor, folkways, and lives was inevitably charged with "nostalgic" feeling-a self-confessed "long[ing] for a time when the world was safer and more peaceful." The "proud land" whose rehabilitation the FSA archive was created to document was increasingly not a matter of land, in Stryker's sense, but of urban and industrial workplaces and dwellings: not the farm but the factory, not the plantation but the tenement, not the lonely byway but the crowded city street. Of the great wave of New Deal-era documentary photographers, a striking number were individuals shaped by these emerging realities. They were men and women for whom Stryker's defining subject matter and underlying vision of America were decidedly foreign. Themselves not quite American-"sort of foreign born," in the idiom of one of their number-they were recent immigrants or the children of immigrants, overwhelmingly Jewish by origin and culture, and citizens all of that capital of the twentieth century, New York. Intimately familiar with the cultures of the street corner, shop floor, and tenement, they took up the camera not to document a vanishing America but to turn the lens on what they knew-the coalescing lifeworlds of urban work, community, street culture, and struggles to assimilate and survive. Nor did they mourn the memory of a lost American innocence, some "safer, more peaceful" past. Whatever their social status or origins, they owed their own presence in the New World to a succession of definitively modern traumas: pogroms in Eastern Europe, the Soviet revolution, the hard fall of the Ottoman and Austro-Hungarian empires, bloody Stalinist purges, the swift rise of the Third Reich. This shared history attuned them to trauma as the de facto subject of New Deal-shaped documentary, but it also disposed them to resist its assignment to their own experience. Against their framing as victims, history's left behind and dispossessed, they understood themselves as quintessentially modern subjects, attuned to the psychic and temporal dislocations that constituted all social experience in an era of economic stagnation and rapid change. Given this history, dwellers of the downtown streets and tenements were doubly marked by trauma. Victims of poverty and ignorance, they also appeared out of step with the march of progress. In that sense, they were ideal photographic subjects: already "frozen in time," inhabitants of a time that had "becom[e] another place-The Past." Yet the history and experience in the historic ghetto of these Americans in the making bespoke a reorganization of U.S. social institutions and a heterogeneity that was irreversibly transforming the texture of everyday modern life. Their bustling sidewalks, their dingy sweatshops, their crowded theaters and cafΘs-all were crucibles for new forms of communication, labor, political activity, media, and entertainment that became emblematic of America's modernity even as they shaped it. Both an agency of modern times and an emblem of arrested time, the Lower East Side embodied a condition of strikingly mixed temporality. Worlds away from the sharecropping South and the Dust Bowl West, it was a resonant place to document urgent experiences of American loss and social transformation. It was also a productive place for meditation on the nature and effects of documentary imaging. To what degree did images of the ravaging effects of the Depression put its subjects beyond the reach of mobility and change, consign them, in the freeze-frame of the photograph, to a superseded order of historical being? Attuned to a legacy of images of the ghetto and its citizens as benighted, atavistic, or unfit for modernity, photographers who experimented with ways of seeing on the Lower East Side made this question central to their practice. In response to the vibrant social life of New York's downtown, they aimed to accomplish something other than the recording of trauma, dispossession, and loss-or even expression of the inevitable failure of such an aim. They sought to remake the photograph itself as a space of experience in which historical being, the urgent problem of belonging in America and to its ever-evolving modernity, could be explored. While the imaging practices of the FSA involved photographic raids on targeted sites of loss and rehabilitation, these photographers' practices were predicated on their shared experiences with their subjects-not least an uncertain or incomplete sense of belonging to interwar America. They wielded the documentary camera not as a power imposed from beyond or above but as an agency activated within vital social relations in service of a social view from below. Their images take on something other than the attempt, as FSA photographer Gordon Parks put it, to "expose the evils of poverty" and bring into view "the people who suffered most under it." At their best, they exploit the temporal structure of photography itself, its agency for arresting time, to address the problem of finding a place in modern times, and they feature the dwellers of New York's iconic downtown as exemplary subjects of that aim. Beyond the project of the Historical Section or the work of exposing social ills, in excess of what we might call the trauma of trauma, these images are interested in what it means to belong to a turbulent history in the making. To focus on the photographers who made photographic capital of the Lower East Side is inevitably to rethink the aspirations and the afterlives of documentary imaging of the so-called documentary decade. The relevant bodies of work vary widely in aesthetics and reception; their makers shared an animating context and a heightened interest in temporal identity rather than any institutional affiliation. To read their engagements with the social space that was their stage, laboratory, and point of departure requires attention to the social histories of mobility, labor, citizenship, and dwelling that made that space challenging and iconic, and in turn informed the uses of photography as art. What follows, then, is both an argument about the unfolding history of documentary photography in the United States and an attempt to write that history differently, beyond familiar institutional contexts and the familiar art-historical model of the singular, timeless artist. Returning the documentary camera to its embeddedness in a social space marked by temporal multiplicity, we open a new view of its understandings of modern temporality and modern times. 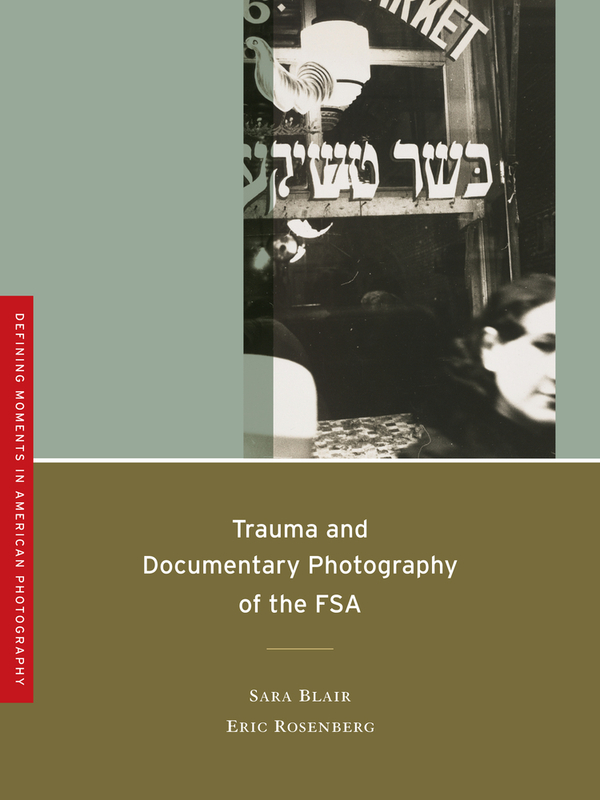 The latest volume in the Defining Moments in American Photography series, Trauma and Documentary Photography of the FSA proposes that we reconsider the work of the Farm Security Administration and its most beloved photographers in light of various forms of trauma in the 1930s. The authors offer new ways to understand this body of work by exploring a more variable idea of documentary photography than what the New Dealers proposed. Taking a critical look at the FSA photography project, they identify its goals, biases, contradictions, and ambivalences, while discerning strikingly independent directions among its photographers. Blair and Rosenberg discuss how, in the hands of socially minded photographers seeking to address and publicize suffering, photography and trauma mixed. In the volatility of that mixture, they argue, competing ideas for documentary took shape. Among the key figures studied here are some of the most beloved in American photography, including Walker Evans, Ben Shahn, and Aaron Siskind. Sara Blair is Professor and Director of Graduate Studies in English Language and Literature at the University of Michigan and author of Henry James and the Writing of Race and Nation (Cambridge, 2009). Eric Rosenberg is Associate Professor of Art and Art History at Tufts University and author of Trauma and Visuality in Modernity (Dartmouth, 2006).